Carnegie Court Hotel is an oasis of style and luxury complimented by traditional values of hospitality and excellent service. Wood, stone, metal and fine fabrics in warm earth tones set against neutral backdrops create a design style that is very inviting. 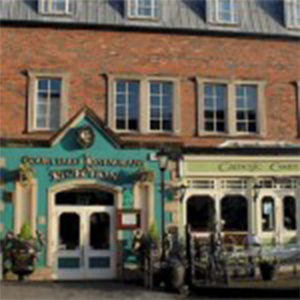 The Carnegie Court Hotel is located a few minutes from Dublin Airport in the heart of Swords, north of Dublin. It is a family-run hotel and offers free Wi-Fi, an award-winning restaurant and a bar. The Hotel is also on close proximity with the coastal villages of Malahide, Portmarnock and Howth, while visiting the Carnegie Court Hotel, make sure you visit the beautiful Malahide Castle and the beautiful Talbot Botanic Gardens adjacent to the castle. Of course a visit to the Portmarnock hotel would not be quiet right without visiting the Jameson Irish Distillery located in Dublin city. One of Sword's liveliest, cheerful and enjoyable bars is The Harp Lounge. The barcaters for all tastes, whether you want to enjoy a quiet drink, some afternoon pub grub with the family we have all it covered. Also seductive and Inspired by the historical Moulin Rouge in Paris, our Rouge Nightclub is located at the hotel. The nightclub is available to hire out privately for party occasions. We have plenty of live music every Friday & Saturday and Sunday and various bands perform live at the Harp Lounge at the Carnegie Court Hotel. Click here to find out more about upcoming events, DJs and bands. The Courtyard Restaurant is award-winning restaurant that offers delicious meals in an elegant relaxed setting. We offer wide range of fine wines at a reasonable price. Welcome to Carnegie Court Hotel. Located just 15 minutes from Dublin International Airport and only 20 minutes from Dublin City Centre. We are perfect place to stay if you are attending the sport venues to watch your favourite team plays live in places such as Aviva Stadium or Croke Park. We offer meeting, event, function and conference rooms that can cater for small meetings, interviews, training workshops and large corporate events. The Carnegie Court Hotel offers 36 en-suite bedrooms.The Bedrooms are spacious and tastefully decorated to ensure a relaxing and pleasant stay for the guests. Click here to find out more information about our bedrooms and facilities.